Nine Boston-area artists are currently exhibiting at the Institute of Contemporary Art/Boston’s 2010 James and Audrey Foster Prize Exhibition. The artists, finalists for the prestigious $25,000 Foster Prize, create work across a wide spectrum of visual disciplines and artistic practices. We recently shared Studio Views with Foster finalists Fred H.C. Liang and Evelyn Rydz, engaging their work through the methods and places it’s created. 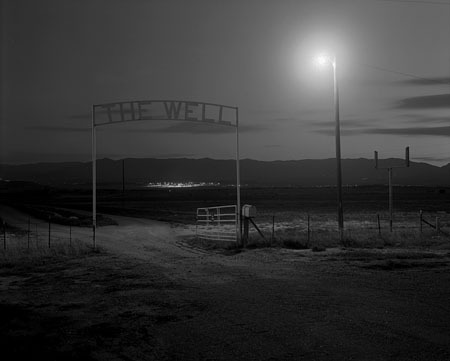 Here, Stephen Tourlentes (Photography Fellow ’05) offers a look into the intriguing process behind his haunting photography: black and white, large format prints observing federal prisons at night. To start, I photograph much of the time out in the world. So the first part of my studio practice actually happens out in the physical world. I still enjoy being subjected to the elements and all the challenges that come with witnessing the world through photography. 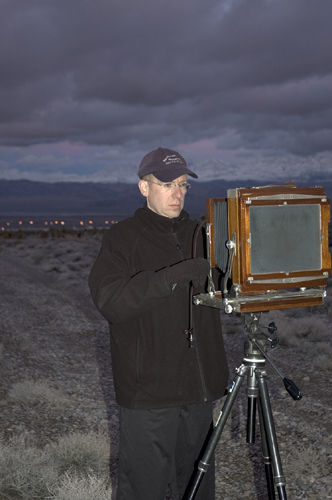 Even in this digital age I still use a large format 8×10 view camera and film. I like how film responds to low light and appreciate the size of the large negative. Most of my exposures are at a minimum 3 minutes up to 30 minutes in length, depending on the conditions. It is a very slow, long look. 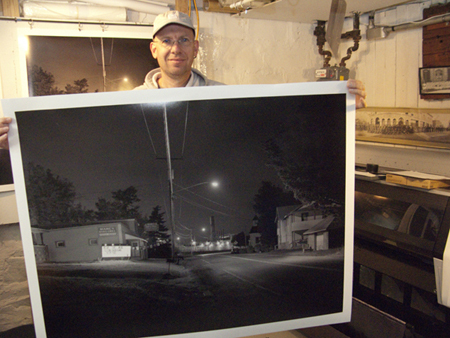 Once I’ve returned to the studio, I go into the darkroom and process my sheet film by hand. 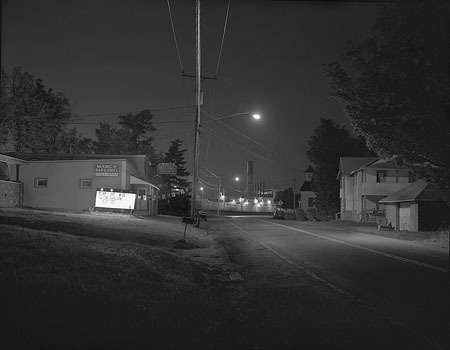 At this point I depart from the traditional darkroom and take the processed film and scan it into my computer. Because the negative is so large, I work with a good quality flat bed scanner to scan my negatives. 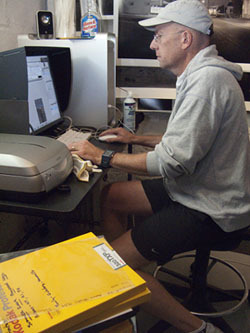 I prepare the file using Adobe Photoshop for printing on my large format inkjet printer. Much of my time is spent spotting and cleaning up dust and scratches that would not show up on small enlargements but become distractions once a print is made big. 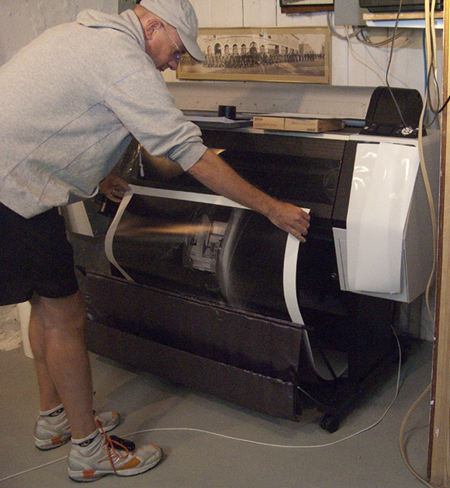 I can print images up to 44″ wide with this particular printer. It uses pigmented inks and I print with Canson Baryta paper for my final images. Once the prints are finished I bring them to Color Services in Needham and have them mounted on “dibond” and framed for exhibition. 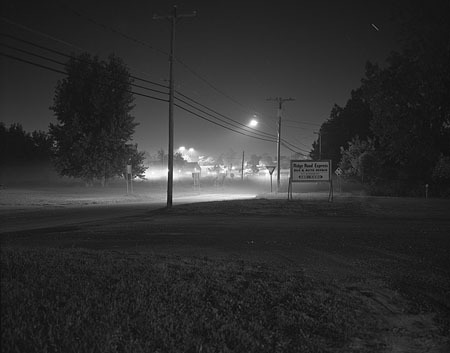 Work by Stephen Tourlentes, along with that of the other eight 2010 Foster Prize finalists, will be exhibited at the Institute of Contemporary Art/Boston through January 17, 2011. 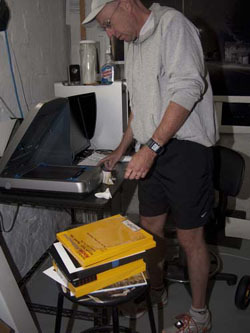 Images: all images courtesy of Stephen Tourlentes; FLORENCE COLORADO FEDERAL SUPERMAX PRISON (2005); Tourlentes at work in Las Vegas; scanning a negative; “cleaning” the photo digitally; using a large format printer; Tourlentes with a completed print; MARCY NEW YORK STATE PRISON (2008); ALBION NEW YORK STATE PRISON (2008).